If readers of this blog found me promoting (or having) a photo contest, and in the T&C was language akin to "you grant perpetually all rights for free when you enter..." or some variation thereof, not a single person would believe me if my excuse was "oh, the lawyers wrote that up, I didn't see it, I'll change it now...". And, you should fully doubt that mea culpa. Why? Because rights and contracts and the analysis thereof is what I do when I am not making pictures. On a comparative note, if someone were a chronic car thief, should we applaud when he just steals from department stores? The argument would be "oh, but he's so much better now..." when what he is doing is still theft. So, it is with the perspective of the above to scenarios that the changes that C-Registry has made are dubious. The people who run C-Registry have been around a long time in this business. A LONG TIME. The notion that they didn't know what they were doing or, as they note in their own words as citied in an AMSP Member Update - "In retrospect, we were overly zealous with our marketing language" is just not passing muster. I submit that they knew EXACTLY what they were doing with that language, and are only now pulling back because they were called out on it. Further, it has been suggested that they have made changes to their offering to answer the concerns put forth, yet there are many other points of serious concern that remain. So, let's continue the discourse. If C-Registry is truly committed to helping photographers, rather than lining their own pockets, straight-forward and complete answers to the following questions need to be answered. Until recently, your terms and conditions included express provisions allowing you to license registered images at your discretion. You have explained elsewhere that this was a mistake and that you regret including those provisions. You have removed the provisions but left in provisions that allow you to add those terms back into your terms & conditions and any other terms at any time, at your sole discretion. Setting that aside, please explain the intended purpose of those licensing provisions clearly and succinctly. Just to set the record straight, please answer these yes or no. After answering each of the questions yes or no, you can provide as much detail as you wish. The act of discovering the use? Yes or No. The act of informing the rights holder of any of the details of the use? Yes or no. The act of mediating a dispute between the rights holder and the image user. Yes or No. The act of billing or invoicing for the image user a fee or other payment related to the use of the image. Yes or No. The act of facilitating a grant of license between the rights holder and the image user. Yes or No. The granting of a license on behalf of the rights holder? Yes or No. If you answered yes to any of the above, please describe. While there is currently no mention of image licensing on your site, are there any circumstances under which you might later solicit registered photographers to offer their work for stock licensing via any stock licensing platform or site? If so, describe. Does the designation of “work of unknown origin” have any bearing on a user’s ability to proceed with usage of an image? C-registry is soliciting image users to buy certificates that a photograph is a work of unknown origin because it is not registered on c-registry. What possible purpose might such a certificate serve as of today? Why do you include this provision at this time? It leaves infringers with the impression that they may proceed to use work provided that if the rights holder appears, the infringer will negotiate in good faith. Isn’t it illegal to proceed with the use of a work without the rights holder’s permission, even after a failed search at c-registry? What is the purpose of requiring that infringers print a credit line that informs others where the work can be found? On the C-Registry home page, after all the edits, their marketing language remains alarmist, and misleading, when they write - "Reclaiming your works online is critical...Take action today and begin reclaiming your works." Reclaim: to claim or demand the return or restoration of, as a right, possession, etc. The problem is - there is nothing to "reclaim." While the copyright will always be yours unless you expressedly transfer it, no language in any version of the orphan works bills that have been proposed would allow a copyright holder, once a work has been deemed an "orphan", to stop the work from continuing to be used in whatever manner it was after it was deemed an "orphan." There is no mechanism to "demand the return or restoration of, as a right, possession". The use of the word "reclaim" is, at best, misleading. One of the most important notes to make here, is that if C-Registry is a success and is purchased by a major stock agency or media company, the operation of the registry will fall under the control of a single stakeholder, and nothing in its charter or other language suggests that they would not do this, and that should scare people. There are, no doubt, other questions out there that remain, so feel free to pose them in the comments below if I have missed something. I await full and complete answers to the above questions, without any spin. So says Lauren, in one of Microsoft's latest commercials. Now, I'm not saying Microsoft isn't cool. They have some awesome applications - like Expression Media, Sea Dragon, and so on, and they are spending much more time being photographer-centric. In fact, I run a HP Windows Home Server in my office with 7.5TB of storage space so I can access my archives from the road. However, Lauren IS suggesting she's not cool enough to be a mac person, and she's shopping price alone. We can presume Lauren is shopping features and quality, and she says something to the effect that "I got everything I want", but let's discuss price-shopping, since that is the point of this commercial. *** UPDATE *** Gizmodo found Lauren, and she's an actress in LA - Someone Found Microsoft's Lauren! And She's an Actress. What Lauren has done is commoditize her laptop. What our clients sometimes try to do is commoditize photography, and the lowest price wins. Clients like this are not loyal. I know that the economy is down, but Nordstrom's fourth quarter sales which included the holiday shopping season showed profits up 22%, and fourth quarter sales increased by 15%. Nordtroms customers don't walk in and focus on price, they focus on the level of service. "Nordstrom thrives on providing legendary experiences through unbelievable customer service, which result in customer folklore and the most powerful word-of-mouth marketing possible", and other stories abound here on the subject. On the photography business side of what we do, customer service is key. We deliver a premium product, and when, like yesterday, the client said "oh, we need to get 7 photos e-mailed to us today for distribution", my answer is the same as it ALWAYS IS. "That's no problem at all. There's a nominal additional charge for that, but we are happy to take care of it." The client today, asked, as about half of them do "ok, do you know about how much?" I responded "yes, as outlined in our paperwork, it's $65 per image we prepare and send out". The clients response? "Ok, that's fine." Later on that day, I conveyed to the client "A number of the people we've photographed have asked about being able to download images, would you like us to set up an online gallery where they can do that?" The clients response? "Yes, that's a good idea." In both cases, we solved the clients problems or needs, despite having several other things we had to tend to that day. This client was not a price shopper, they were a quality service shopper. Almost all our clients are quality-and-service-first clients. But the question is, how do you get those clients? Easy - it takes patience. The question often put to inexpensive photographers is - would you rather do 10 $1,000 weddings, or 1 $10,000 wedding? Well, the fact is - $1k weddings beget $1k weddings. The decor is usually minimal, and the scenery that makes for a potentially great wedding album (and thus, portfolio) isn't there. It may take more effort and time to book the one $10k wedding initially, but once you get the word-of-mouth ball rolling, booking $10k weddings is usually not much harder than booking a $1k wedding, relatively speaking. We still do get calls from clients who want to pay a pittance, or want all rights. We treat them just like those who are not price shoppers or rights grabbers, up until they decide to use someone else, and 90% of the time that's the case, and that's ok. We move on. Over time, the 10% that go with us realize the value of what we offer, and are lifetime clients. Occasionally, they will stray, but usually they come back after a bad experience with another photographer. However, statistics suggest that for 1 in 5 prospective clients, price is only a detail, not a deciding factor. Over time, "collecting" just the 1 in 5 clients that have this perspective, will yield a client base that is sustainable. This is what we have done. It's not rocket science. We never put ourselves in a position where we had to accept a bad deal. Thus, over time, fair deals with fair and reasonable clients, are what constitutes our client base. Today, before I had arrived back to the office, I spoke with the client and she said she had raved to her boss back in the company headquarters in their home state about how great it was to work with us, and she made a point about asking for my card at the shoot. My Office Manager sent me an e-mail phone message quoting the client as telling her we had done ". . .a fantastic job. Just wonderful." Will Jill have a break/fix incident that requires her to ship her computer somewhere, or make a call to Bangalore where she gets further frustrated? Likely, Jill would opt out of the additional $250 3-year Applecare service contract that is regarded as a "must have" for a laptop purchase? Apple has such significant brand loyalty because of customer service, ease of use, and ease of troubleshooting. How many lost hours of productivity, or interruptions in a business day will Jill have that will end up costing her client revenue because she went with the cheap laptop? How much will Jill spend with break/fix incident calls when something isn't working? Consider that a Panasonic Toughbook, for example (yes - they run Windows!) is $5k or more. These machines are designed to take abuse, be on the road, and so on. Further, Panasonic's customer service for these machines is exceptional. With a $1k machine you're getting older/slower technology, and shaved corners on things like soldiering, or sub-standard CD drives. Avoid being the cheapest. Strive for a clientele that pays you what you are asking. Like Nordstroms, during a downturn in the economy, it will be much easier to weather the storm if your clients are not so price-focused, and are more results and service oriented. Sources are telling Photo Business News that Getty Images has laid off their entire creative department in Los Angeles, although the LA office remains open - likely with editors, photographers, and sales people still hanging in there. However, that was a part of a much more global round of layoffs. While we are prepared for this to be a typo, the layoffs in the Los Angeles office are a part of another global round of layoffs purported to be, once again, over 100. Just 10 days ago we reported (5% Of Our Workforce Will Be Asked to Leave Getty Images, 3/16/09), 110 layoffs, and it is unclear if the layoffs in LA were a formal "layoff" as opposed to the "asked to leave" approach. I can't believe that Getty would confirm 10 days ago that 110 people were being "asked to leave", only to follow 10 days later with actual layoffs of them, or, frankly, of another 100+. While we are working to confirm which way this wind is blowing, we will put it out to the masses for discussion since we can confirm the LA creative department layoffs for sure. This falls into the "what were they thinking?" category. Would you agree to these terms, or are you contractually allowed to if you are already represented by a stock agency? YOU authorize The COPYRIGHT REGISTRY to represent INFORMATION, YOU and your CONTENT in collective bargaining for use of CONTENT by third parties and to execute licenses on your behalf for collective uses of CONTENT on terms to be determined by The COPYRIGHT REGISTRY at its sole discretion. Shrouded amidst the nice-sounding concept of helping you with copyright related issues, the C-Registry, which we reported on back in November at PhotoPlus Expo, is the above language, which is, at best, horrible. There is a significant amount of mis-information on the C-Registry site (here are their legal terms and conditions), which seems to suggest that, in order for you to be protected by copyright, you must "claim your copyright". Let's get one thing perfectly clear - you do NOT need to "claim your copyright" in order to have copyright protection. You DO need to register your copyright with the Library of Congress' Copyright Office in order to have the broadest remedies available to you in the event of an infringement. According to c-registry, photographers who fail to “claim” their copyright at c-registry do so at their own peril. While you should register your copyright, this is alarmist marketing, but it gets worse. 1. If an author has not claimed copyright for that work, it is considered “orphaned” at that moment in time. In this circumstance, you can and should create a verifiable, trackable report indicating that the work in question was “orphaned” at the time. To create a report, click “Create Certified Report” in the menu on the right side. In other words they are telling infringers that they are free to infringe any work that is not registered with c-registry, and they will give them a certificate to prove it. They also instruct that photographers can designate a URL on the photographer’s website, and that all photographs uploaded to that particular URL will be registered automatically by c-Registry. This is an extremely dangerous scenario for photographers. If an infringer takes images from a photographer’s website, the photographer is only entitled to a single statutory award, for ALL images infringed, regardless of the number of images that the infringer takes and uses without permission. By encouraging photographers to dump their images onto web pages so that c-registry will automatically register those images, c-registry will cause those photographers to lose one of the primary protections afforded photographers under copyright law. Further, throughout the site, they refer to the “orphan works act” as if it exists as law, rather than referring to the failed “bill”. "As promised last week, there are new membership benefits that ASMP has negotiated on your behalf", and then amidst the other 3 benefits they list, they advise ASMP members - "...the service could benefit you in two ways. First, it can help new clients find you from your images. Besides just being good business, this could become a useful defense against your online images being treated as orphans, if (or when) an Orphan Works law is passed. Second, it’s can help you find any unlicensed users so that you can encourage them to obtain a license." "If an author has not claimed copyright for that work and is unknown by any other means, it could be considered "orphaned" at that moment in time. In this circumstance, you can and should create a verifiable, trackable report indicating that the work in question was "unclaimed in The Copyright Registry" at the time. To create a report, click "Create Certified Report" in the menu on the right side." This is only the beginning of the scare tactics that commercial registries will employ to scare you regarding your copyright to your works. Yes, copyright is important, and yes, Orphan Works legislation is coming and is a threat to your creative works, but this, as they say, "if it walks like a duck, and quacks like a duck, then, it's a duck." This looks to be a scare-tactic ploy to get your images into StockPhotoFinder.com, among other things. Further, here, C-Registry claims to have “relationships with the most prestigious trade associations that are proponents of copyright”, and here, C-registry lists APA among trade associations during registration, in the drop down menu at the top, and since APA has not only not endorsed them, they have come out with a red flag APA Alert, and this is positioned to possibly imply that those trade associations may endorse c-registry, This raises the question - how many on that list have endorsed them? How many don't know their name is being used here? If the CONTENT is an Orphaned Work used editorially, use or publication should bear a credit line that indicates the source of the CONTENT. Several entries down, you'll see the URL that ends "=47", and instead of clicking the link, click the "cached" link, and there it is. You might try clicking this link to take you to the cached entry, if Google didn't expire the cache link. Then compare it to this link, of the currently displayed page. This is looking more and more nefarious. I wonder what else they have switched out. Further, did anyone bother to check the Network Solutions "whois" database, to learn that StockPhotoFinder.com happens to ALSO own c-registry.com? (information here). Whenever you read "I want to leave to spend more time with my family", or some variation of that sentiment, almost always, that means the person was forced out. But, well, maybe that's not the case with the departure of Bruce Livingstone, the CEO of iStockphoto and also Senior Vice President of consumer markets for Getty Images. Maybe he was just sitting around keeping his seat warm? "...After deciding he was not going to make it in the traditional stock photography business, Bruce created a free Web site to share his images with a network of designer and photographer friends, and iStockphoto was born. Initially a trading site, iStockphoto introduced the micropayment model in 2000, where buyers purchase credits in blocks starting at $10 each." I now might make a wild guess he's now not making it in the microstock business? A reasonable guess at his contract is that he won't run a competing business for a set period of time - usually 3 to 5 years, but this is for his possible job options post-employment with the company. How much do we think he's getting from Getty? Well, according to this February 9, 2006 article in the Puget Sound Business Journal, Getty "set aside $4.3 million in escrow that will be paid to key employees who held iStockphoto shares after they complete up to three years with Getty." Gosh! That three years was up just a month ago, so maybe he wants to spend his ill-gotten gains, earned at the alter of "deep-and-cheap" stock photography, on his private life? I'm guessing he is getting a good chunk of that $4.3m. Daryl Lang over at PDNPulse is reporting in his coverage of this announcement that Getty says this was planned for some time. No doubt, that is the case - so Livingstone can cash out from the escrow account. One thing is for certain - if Livingstone has a non-compete clause in it, we should thank our lucky stars that Getty insisted on that language, so he couldn't start up another stock photo business model that will continue the downward spiral of rates for photographers, at least not for a few years, anyway. But who these days would even put venture-capital money into an effort like that? So, it can only be guessed that he will go off any take his "genius" to some other industry and wreak god-knows what havoc on their business models in other industries. HIs handle on the iStockphoto forums was "bitter", originating, it has been said, because Livingstone was a bitter and disillusioned photographer who couldn't get anyone to take his images and sell them, so he started his own business to do just that - a sort of a stick-in-the-eye of those who had refused him before. One can only wonder, if the above is, in fact, true (or even a shade of the truth), what other industries he is bitter about? Where does he want to go and "work his magic" next? Welcome to the Blogosphere ASMP! Anytime additional resources and time are devoted to the disbursement of business knowledge to the photographic community it is a good thing. 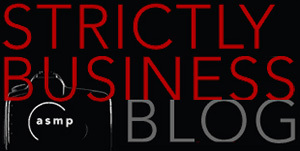 Yesterday, ASMP announced their Strictly Business Blog, and I encourage you to check it out. There are two videos there, one about how several notable photographers got started in the business, and the second, about the value of copyright. The blog, as Susan Carr notes in her welcome has contributors that "... are ASMP educators who will share posts you can enjoy with your morning coffee, on a break or a commute. Add the ASMP Strictly Business Blog to your daily routine and start focusing on your business now." I feel so strongly that you should add this to your RSS reader, and check it out every day, that (at least for now), I've included an RSS feed reader to the permanent blog layout on the right there, above the categories and ads, to use an old newspaper adage - "front page, above the fold." So, as ASMP adds content, you can click right over there to read it, as well as explore around. The atmosphere in the audience at the panel discussion was very tense, I am told. Recently, Forbes wrote about one of the proponents of spec work, CrowdSpring, in this article - The Creativity of Crowds, 1/22/09. The short answer: OF COURSE Spec Work is evil! However, it is of great value for you to hear from the other perspective so you can better understand your own!